Do you ever reach the point where you have been trying and struggling so hard, for so long only to feel like you are hitting a wall repeatedly? Or the other scenario is things are going pretty well and then suddenly, when it rains it pours and it feels like it is all hitting at once. So what do we do in situations like this? Do we continue to strive? To push forward trying to fix it all on our own? Or do we finally stop and recognize once again that we are restless, striving and pushing towards something on our own. Once we “arrive” does that mean we won’t be restless anymore, stop striving and pushing? Maybe for a little while but it won’t last long. 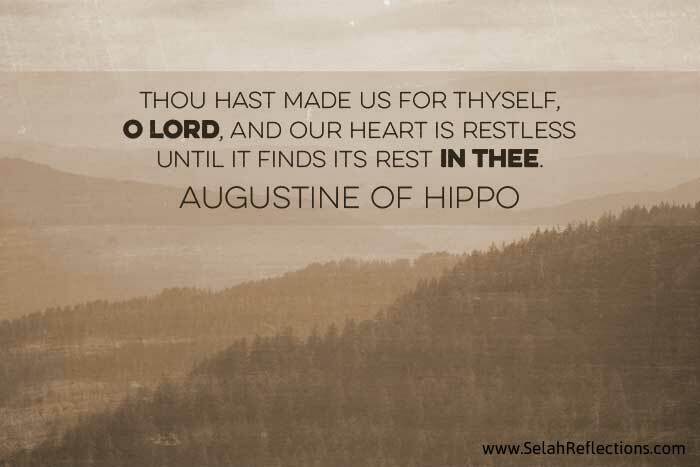 Rest, real rest cannot come from us, it has to come from Him, the one who made us and the one who asks us to stop and find rest in Him. So why is this so hard for me to remember? I get wrapped up in the moment, the demands of the day, the big looming decisions and forget the one who is in control, the one who is waiting for me to stop and stop striving and pushing.